Meet Alex and Lulu, a sweet little dog and cat who are about as different as two friends can be. Alex is all action and likes to climb trees, run and jump. Lulu likes to sit quietly, watch ants and paint pictures. One day Alex begins to wonder if in fact he and Lulu are too different to be best friends. “It doesn’t matter how different we are – think about all the things we like doing together,” says Lulu and reminds him of the fabulous Alex and Lulu Super-Groovy Disco, pillow fights, star-gazing and reading. The story finishes with a beautiful illustration of Lulu painting a cardboard boat that Alex is captaining. This simple story by Lorena Siminovich (the designer behind Petit Collage) is perfectly pitched at pre-schoolers who are going through the inevitable stage of identifying their ‘best friend’ (even when the feeling might not be mutual!) and pondering why and how friends get along. 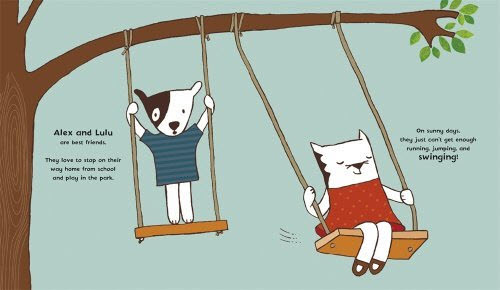 There are lots of stories about friends who aren’t getting along but what sets Alex and Lulu apart is the superb production of the book – thick, matte pages and illustrations that feature snippets of collage and retro-patterned backgrounds. Every page filled with colour – my favourites include the vibrant red Super-Groovy Disco spread, complete with mirrorball and a dancing sock monkey and the exquisite , thoroughly retro green and orange kitchen featuring simple white line drawings of indoor plants, a pendant light and 1960s furniture. Alex and Lulu – Two of a Kind is available from Fishpond for $19.95. 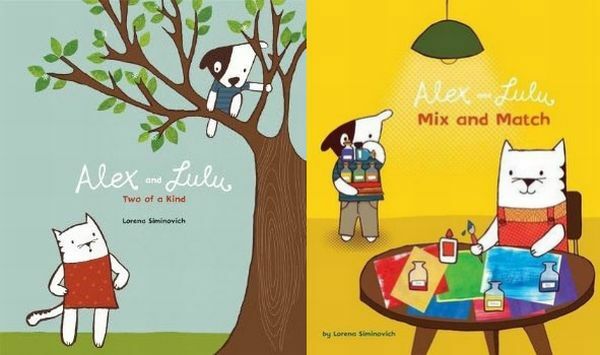 Also available is Alex and Lulu – Mix and Match.